More than three quarters of directors surveyed by McKinsey admit they don't fully understand how their firms create value. Invest more effort in attracting the right expertise. Hire board advisers with deep specialized knowledge. Apply retirement rules in a way that balances the need to refresh the board with need to retain valuable insight. Before we churn a generation of directors, perhaps we should focus on the problem and not the symptom. If most company directors don't understand, they're not the problem - it's their training. Directors aren't taught to understand how their business creates value. And even if they have some idea, chances are their business models are outpacing the language they have to describe them. The solution for the 78% is to start building new tools and language to help them see how their business really works. To understand how firms create value, see it as a system designed to create sufficient business critical value to survive, grow and prosper in its own right. There is no customer other than the corporation at the centre of this system. A business model describes how a firm creates life-sustaining value. It's different to a strategy. Strategy tells you how you'll beat the competition. What the business model tells you is how you'll be in business tomorrow to beat the competitor tomorrow. Spending time on strategy is not the same as spending time on the business model. Porter's 5 forces helped visualise strategy. What directors need is a way to visualise their business. Most business model templates only focus on how firms plan to make money. Business Model Canvas is wildly popular and a great tool if you want to understand how a firm makes money from its customers. But how you'll make money from customers doesn't explain how you'll stay in business. These tools are great, but can leave business leaders blind to how build a firm that lasts. To start understanding how a firm creates value, and not just money, over the long term take a pen and paper, draw X in the centre and follow along with this thought experiment. X marks the spot and the firm as independent and sovereign. An entity its own right that's in the business of staying in business. The biggest difference between my model of a business model and others is that I put the firm in the centre. Other models focus on how to create value for customers and stakeholders. Mine focuses on creating value for the firm. Now draw a big circle aroundX. Culture surrounds the firm. As Drucker said, culture eats strategy for breakfast. Everything done in the name of the firm is invested with culture and it can be the silent agent - or enemy - of value creation. 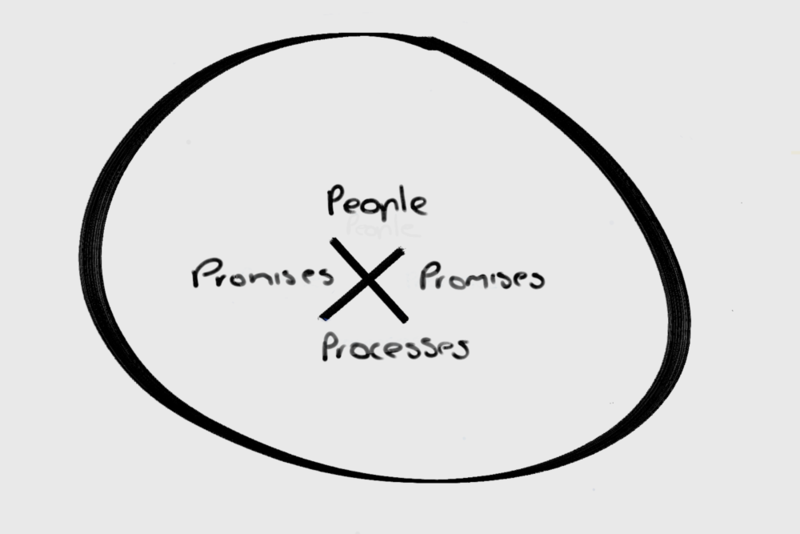 Firms are made up of people, processes and most importantly the promises made in exchange for the money and things the firm needs to survive over the long term. Now, draw an infinity loop that follows the lines of X. This loop is at the core of every business model. It represents four types of trade a firm makes to get what it needs to survive - things for cash, cash for things, things for things and cash now for cash in the future. Each type of trade delivering different life sustaining value to the firm. The strength and integrity of that loop is the measure of a firm's sustainability. On the right of the loop are trading partners that supply things - ideas, time, labor, data, products and services. Everything the firm needs other than cash. On the left of the loop are trading partners that supply cash - customers, shareholders and financiers. To the firm cash is cash. It doesn't matter where it comes from. What matters is the cost of buying it. Next draw a line above. Paul Polman says we don't treasure what we don't measure. Treasure or value is represented above the line. This is where business critical value (cash and things) is stored for the future. Business models create treasure. When a firm trades it exchanges one form of value for another. It also creates new value like brand and trust in the process. Each store of value creates a new opportunity to use that value (and combine it with other value) to support the growth and prosperity of the firm. More than anything else, a firm's treasure determines the shape of a firm's business model and its next pivot. [Tip - First, cash is not a synonym for business-critical value. It's a subset. Second, you need to look hard to see the value created that was not intended. Some of the best business models were created off the back of accidental value. Third, and perhaps key to understanding the concept of value is that everything can be something else of greater value - that half-empty glass makes a perfect vase. Fourth and most importantly there a six different kinds of treasure needed to stay in business. Now ask what does the firm need to survive and prosper- cash or a thing? Now connect the person with that cash or thing to the business through a series of algorithmic assumptions:. 1. identify the need of the firm > 2. identify the market where that need is held > 3. identify the value proposition required to acquire that need > 4. identify the channel to the supplier of that need > 5. identify the supplier > 6. identify the value exchange to and from the supplier. The goal is to create alignment between each of these elements. If there is one thing to take away from this post it's this sequence of assumptions. The key to understanding modern business models is to flip the customer relationship from a linear relationship between supplier > firm > customer to a 'virtuous loop' between $ trading partners > firm < non-$ trading partners. Google has advertisers on the left and users on the right. For its business model to work it needs to understand its markets, value propositions, channels etc on both sides. The right of the model delivering the value that it delivers to advertisers for cash. The perpetuity model gives new meaning to Drucker's saying that “The purpose of business is to create and keep a customer.” In this model the firm is the customer and everyone else is seen as a supplier of what it needs. This flip is essential to understanding contemporary business models. The customer is the firm and the board's role is to create it and keep it going. To be clear, this model doesn't replace the linear value chain and the financial spreadsheets they produce. What it does do is provide the opportunity to gain insight by viewing the firm from a different angle. But remember, many of you have been looking at the firm from the same angle all your professional lives. Like a new pair of glasses, things will start off a little hazy but eventually everything should come into focus. Now draw a line below. Below the line are the resources required to support the business. Everything above the line rests on the foundations provided by a firm's resources. Finally, take a different colour and trace the infinity loop over and over. This represents the invisible imperative that drives the business model into perpetuity. It can't be seen because as Adam Smith said, it's invisible. Coursing through an unbroken loop is the firm's self-interest rightly understood. The invisible hand determines whose needs are met and in what priority based on the needs of X - the firm. All that's needed to stretch and break the infinity loop is for the firm to prioritise the interest of a stakeholder above that of the firm. Adam Smith called it rent seeking. You know it as shareholder activism and the principle of maximising shareholder value. Make no mistake, transferring value to anyone out of a sense of duty for little or no contribution to the needs of the firm eventually leads to weakness and vulnerability. Break the laws of capitalism and the firm spirals downwards. Now draw this 100 or better still 1,000 times. Are you are an artist after one drawing? It takes practice. The more time you draw your business model, the more things you'll see and the more connections you'll make until, one day, you'll understand what your business could do tomorrow, what it should do today, what if you're wrong and what your managers should be working on right now. If the business model is so important to board choices, why not teach directors to draw rather than hiring new directors who might not know how to draw either? Only a bad teacher would suggest that the solution to poor grades was new students. If McKinsey's can't teach directors how to draw their own business model, the directors just have to take a pen and paper and learn to draw for themselves. Learn more about the perpetuity model and what happened when I tried to get business modelling included in a director training program here. The perpetuity model has been evolving since 1998. I'm looking forward to launching the 2015 version later this year. It's a major upgrade but based on the principles in this article. Subscribe to learn more.